Invacare is now Cardinal Brand – Same Great Quality, With a Whole New Look! AllegroMedical.com presents The Powder-Free Vinyl Exam Gloves by Cardinal Health. 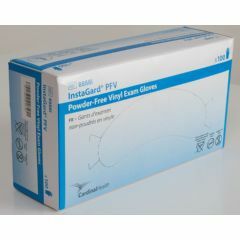 The Vinyl Exam Gloves are non sterile, ambidextrous, powder-free and latex free gloves. They have a soft compound for easy fit and comfort over a long period of time, without compromising integrity or strength. These gloves can be used a variety of ways. These gloves are perfect around the house, at the office, and any other facility where one needs to keep their hands clean. These gloves have been seen on athletes, caregivers, and even cooks! Good Fit. Lightweight. Sturdy. Easy Storage. Comfortable. Versatile. Effective. Use gloves as a caregiver. I should have ordered large, but otherwise I&acirc;&#128;&#153;m pleased. Used to be perfect medium fit, but last few orders the gloves run very small - now having to order large to accommodate all female stylists hands. by salon owner from woodstock, ga.
Good Fit. Lightweight. Sturdy. Comfortable. Versatile. Easy To Use. Effective. Medical Professional. DAUGHTERS WHO CARE. caregiver. My business provides senior and diabetic medical pedicures. Many clients have major issues and gloves are a must in order to protect the clients and to protect the workers from cross contamination.